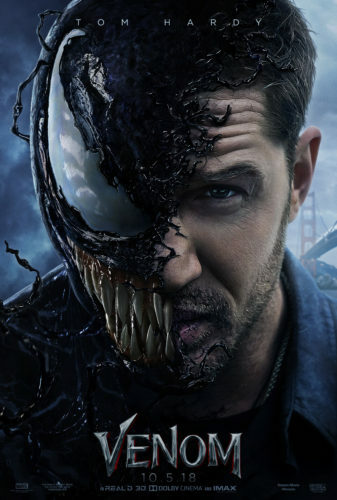 Sony Pictures has released the full length trailer for the Tom Hardy lead Venom film, based on the character made famous in Marvel, most notably his connection to Spider-Man. The film boasts an impressive cast led by Hardy and also includes Michelle Williams and Riz Ahmed. What is confusing about the film so far is where it all exactly fits in. I’ts not part of the Marvel Cinematic Universe (Sony and Marvel/Disney have a separate agreement on Peter Parker), yet it is also rumored by several sources that Tom Holland will make at least a cameo appearance as Spider-Man. The first teaser trailer we got from Sony only gave us bare bones in terms of anything to see; in this trailer we see Eddie Brock and his transformation to the infamous Marvel character, and at least Tom Hardy seems more effective than Topher Grace in Spider-Man 3. While we’re still unsure where this fits in, or why this film was even necessary in the first place, the new trailer has at least started to pique some interest. Possibly based on the first storyline in Venom’s solo book Lethal Protector, the real question for fans is… without Spider-Man, does Venom make sense?